You see some odd things on the subway mixed in with the ipads, e-readers, briefcases, tourist maps, and newspapers. Here are two gems I just had to share. 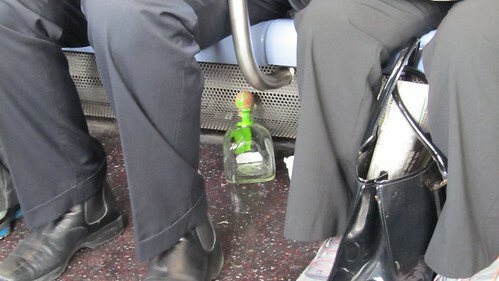 This empty bottle of tequila was riding the train on my afternoon commute. I wonder how it got there. Did some overnight partier extend their festivities into the daylight hours until the poor bottle was finally abandoned and the revelry moved onto another locale? Yes, I’ve seen bicycles on the train before. Usually they have a person with them but this one didn’t seem to have anyone near it when I boarded the train with a handful of other passengers. I was the first one on so I noticed that no one was standing near the bike, it just sat there tied to the center bar as the train car got more and more crowded. 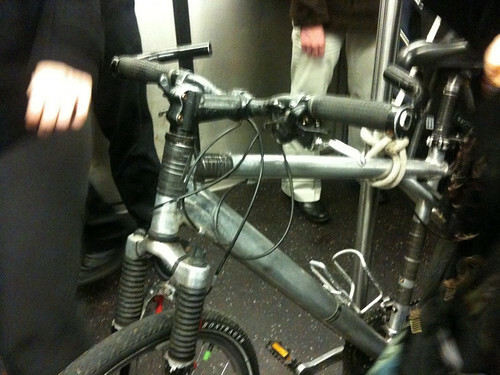 I wonder how long the bike rode the train before it rode away. This entry was posted in everything i've blogged, observations. Bookmark the permalink.